okay! So I posted the worlds smallest street legal car here and now I want to post the worlds smallest car that is actually motorized! 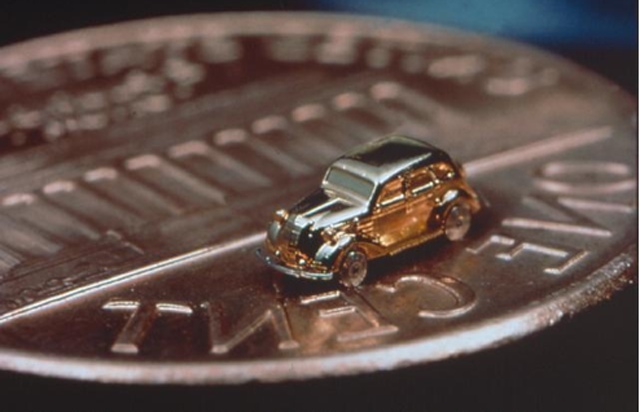 Built by Denso, this very tiny car has 24 individual parts including front bumper, rear bumper, head lights, wheels, tires, spare tire, headlights, taillights, axels, bearings, body, number plate, emblem and step. For size comparison, the bumper is thinner than the average human hair!!! It was modeled after Toyota’s first car, a 1936 AA. 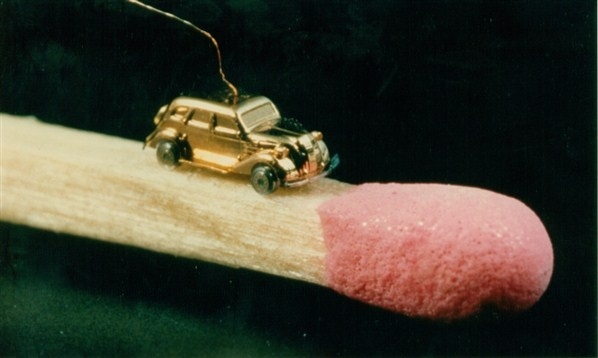 It is powered by a very small magnet motor and when some AC current is passed through its wires it actually drives. It’s top speed is a blistering 5-6 mm per second!! !